Please use the rear entrance to the building (around to the left and down the sidewalk or stairs). The #11 bus stops nearby. Because the Buddha's teachings are considered to be priceless, and in keeping with the teachings and spirit of generosity or dana, this retreat is freely offered. Donations are welcomed. There will be two dana baskets set out at the retreat. One basket will be for you to offer dana for the teacher (cash preferred) and a separate basket for organizational costs incurred by Victoria IMS (cash or cheque). The suggested donation for organizational costs for this two-day event is $40. No one will be turned away for lack of funds. It has been said that the next Buddha will be the sangha. Sangha, which means community, can be thought of as the coming together and falling apart of every aspect of life. This coming together and falling apart is one of Buddha’s central teaching on the “Three Characteristics of Existence”. These three universal characteristics -- impermanence, dissatisfaction and not-self -- can be thought of as the infrastructure of life. Through meditation practice we can acquaint ourselves with their truth and strengthen our awareness of their presence in the whole of our experience. This nonresidential weekend retreat is about learning to relax into the natural flow of the Three Characteristics to more directly experience the freedom of Dharma. The weekend is appropriate for both new and experienced meditators and will include meditation (with instructions), walking/reflective periods, and Dhamma talks. Tuere Sala has completed extensive trainings including: the 2 Year Spirit Rock/IMS Community Dharma Leader Program; a 1 Year Focusing for Complex Trauma Course which incorporates mindfulness principles with somatic listening and a 1 Year Mindfulness-Based Mind Fitness Training Course (MMFT) which incorporates mindfulness principles within the high stress work environments of first responders. She has sat 300+ days of meditation retreat (including residential, non-residential and day-longs) and has a long history of assisting others in establishing and maintaining a daily practice. 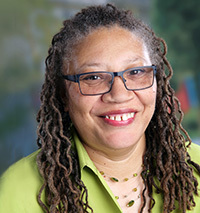 For more information about Tuere, please read her biography on the Seattle Insight Meditation Society website.